Featured: About 500 stargazers and space aficionados visited the H-E-B Planetarium on the Edinburg campus of the University of Texas Rio Grande Valley on Wednesday, July 25, 2018 to catch a glimpse of Venus, Jupiter, Mars and Saturn – and the moon – during a special community event hosted by the university. The Edinburg Mayor and Edinburg City Council, along with the Edinburg Economic Development Corporation and its Board of Directors, lobby the Texas Legislature and the UT System Board of Regents on matters that benefit and protect UTRGV and its School of Medicine, which have major campuses in the city. Recently-hired City Manager Pilar Rodríguez, P.E. is recommending that the Edinburg mayor and city council members, who will be meeting on Thursday, August 9, 2018, approve scheduling a special bond election, to be held on November 6, 2018, for the purpose of generating money to pay for drainage and street improvements, the Edinburg Economic Development Corporation has announced. The amount of the new revenue needed and the specific beneficiaries of the proposed drainage and street improvements will be determined during the Thursday, August 9, 2018 public session of the mayor and city council. The funding mechanism involves what are known as general obligation bonds. PROPOSITION 2 – “THE ISSUANCE OF NOT TO EXCEED $______________ OF CITY OF EDINBURG, TEXAS GENERAL OBLIGATION BONDS FOR ____________________________________, AND THE LEVYING OF A TAX IN PAYMENT THEREOF”. All eyes were on the skies as stargazers and space geeks alike gathered at the UTRGV H-E-B Planetarium on the Edinburg Campus on Wednesday, July 25, 2018 to catch a glimpse of Venus, Jupiter, Mars and Saturn. The university had anticipated about 200 people, but almost 500 gathered at the planetarium for the community event. Attractions included several short films about space presented inside the planetarium, and a special lecture by Dr. John Gerling, which included an “explosion” using warm water and liquid nitrogen. “It is important to inform the public and community about science issues to spark interest and curiosity in kids, who will become our next scientists,” said Dr. Cristina Villalobos, professor in the UTRGV School of Mathematics and Statistical Sciences and Director of the Center of Excellence in STEM Education. The UTRGV Planetarium hosts star watching events every Tuesday with free telescope viewings, but this event was special due to a partnership with community leaders Dr. John Gerling from Gerling Orthodontics in McAllen, and H-E-B, who provided free hotdogs, chips, snacks and drinks during the event. At 9 p.m., once the sun had set and the stars began to sparkle, three massive telescopes were rolled out into the courtyard so visitors could get a good view of the planets. Although it was a bit overcast, lines of people formed, waiting to use the telescopes. Bobby Ray Lemons, 11, of Mission was super excited about space gazing. Madeline and Hailey Cantú, of Raymondville, both clad in outer space T-shirts, said getting to see the planets up close was both fun and a little overwhelming. Their dad, Martín Cantú, said people are curious about the mysteries of space and so many showed up because of the access to the telescopes the university was offering. The UTRGV H-E-B Planetarium is open to the public for planet observations from 9-10 p.m. each Tuesday, and the facility is open from 8 a.m. to 5 p.m. Monday through Friday with extended hours till 10 p.m. on Tuesdays. For more information, visit http://www.utrgv.edu/planetarium. 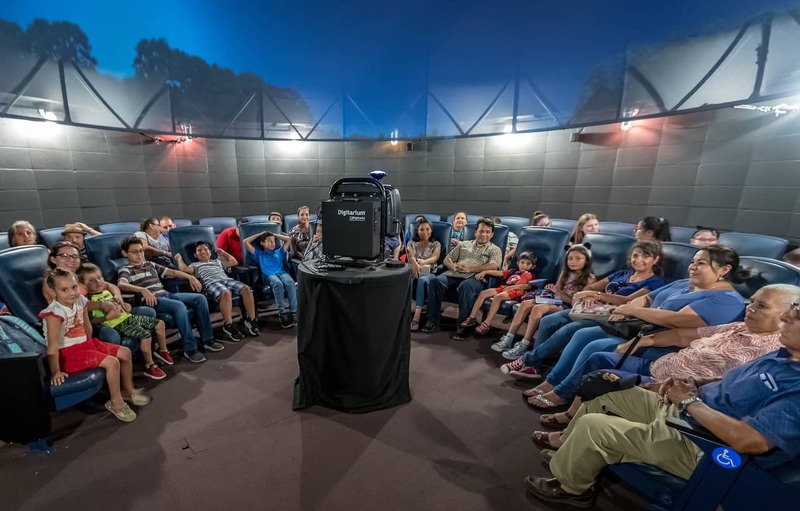 The University of Texas Rio Grande Valley (UTRGV) Planetarium including the UTRGV Portable Planetarium serves the rapidly growing, international, multicultural Rio Grande Valley community. The planetarium creates, promotes, and disseminates learning and educational experiences through utilizing digitally enhanced visualization technology, surround sound and other innovative specialized equipment. The planetarium interactively motivates and attracts youth as well as the entire family and the community toward education by capturing their imagination while educationally exploring the universe through a wide range of disciplines including but not limited to science, technology, engineering and mathematics. The visualization laboratory provided by the planetarium enhances University student learning outcomes through a variety of educational areas and disciplines preparing them for lifelong learning and leadership roles in the state, nation and world community.